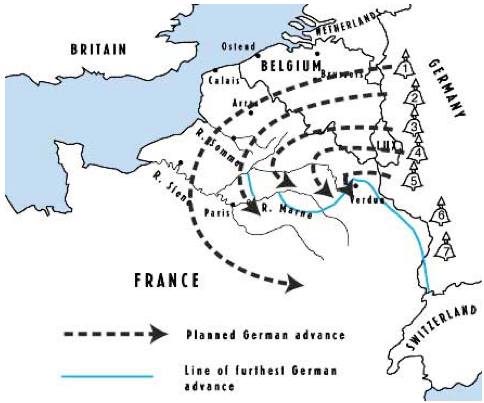 On November 11, 1914, the British set out in the most literal sense to starve the German people into submission; an idea best described by First Lord of the British Admiralty Winston Churchill himself when he stated, "The British blockade treated the whole of Germany as if it were a beleaguered fortress, and avowedly sought to starve the whole population - men, women and children, old and young, wounded and sound - into submission. "40 By 1917, this mission was rapidly coming into fruition, and every month the war was prolonged, the situation in Germany became even more dire. 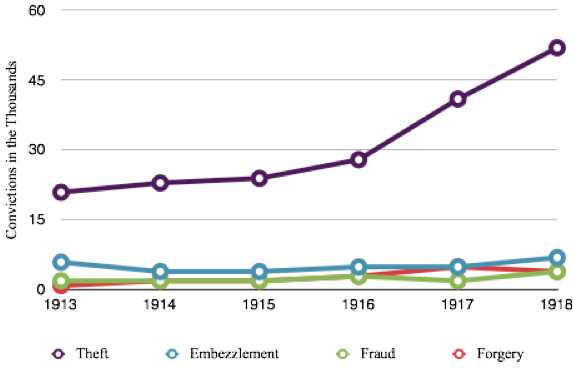 While the German people certainly experienced hardship during 1914-1916, it was during the last two years of the war that their suffering reached its zenith. It was also during this period that the frontline soldiers began to truly feel the effects of the blockade for the first time. This section will look into how the blockade effected life in the German homeland, and at the front lines during the last two years of the war. One of the compounding reasons that civilian life continued to deteriorate in Germany was because the longer the blockade was in place, the more effective it became. 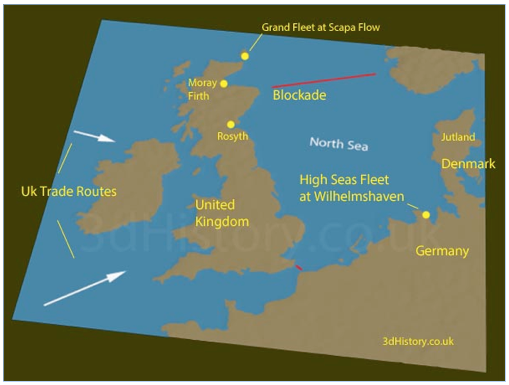 As noted earlier, while the blockade saw a slow start, the longer a peace was delayed, the more time British agents had to locate leaks, and for British officials to swing neutrals in-line with the allies war aims. 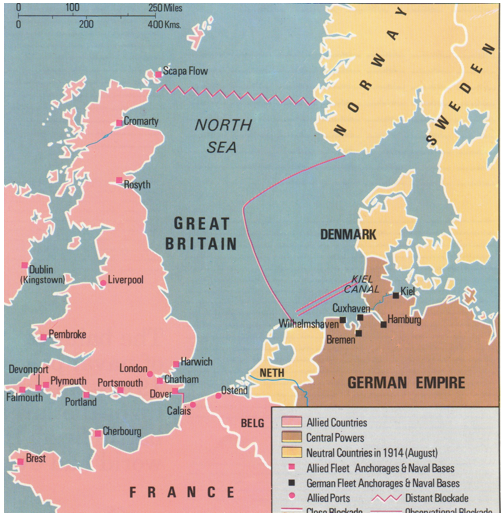 By the beginning of 1917, the blockade had been in effect for almost two and a half years, and early obstacles such as Germany's ability to obtain large stocks of canned meats at the Danish port of Copenhagen were adequately addressed.41 By 1917, only Sweden, and a handful of other minor sources on the European continent were selling goods to Germany, and these were nowhere near enough to meet the countries pre-war needs, let alone the increased demands due to the scale and pace of WWI.42 In short, by 1917 the blockade had truly begun to change the face of the German war effort because it threatened Germany's ability to feed, clothe, and arm itself for the long haul. These unsustainable eating habits, and unhealthy weight loss caused a greater proportion of the German population to suffer from a host of chronic illnesses which ranged from mild aliments like influenza and dysentery, to more serious afflictions such as typhus, tuberculosis, and scurvy. Vincent noted that between 1917-1918, the number of tuberculosis related deaths increased seventy two percent when compared to 1913 statistics.45 One possible reasoning for this drastic increase in fatalities is that without access to foods containing proper nutrients, the body's immune system begins to shut down, leaving the individual highly susceptible to contracting communicable diseases. It should not be assumed that these conditions were entirely the result of poor diets. Rather a large reason the German masses suffered from nearly constant illness was due to the fact that cleaning products such as soaps and detergents were strictly rationed, or completely unavailable during the war. Similarly, new clothing and articles like towels, rags, and linens were also in short supply.46 Vincent argues that even though millions of Germans wore unclean and tattered clothing, or lived in less than tidy surroundings, the majority of these illnesses could have been prevented, or at the very least properly treated with an adequate diet.47 Thus because the British blockade prevented Germany from importing foodstuff, the population was unable to properly feed themselves and maintain basic body functions. Combined with the scarce availability of cleaning products or fresh clothing, a great proportion of the German population was keenly susceptible to infections and disease. 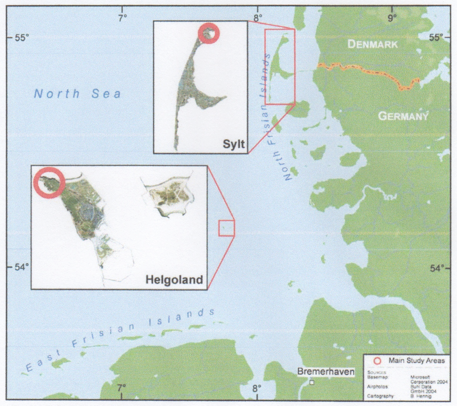 The blockade did not exclusively affect German population, but also impacted the livestock throughout the country as well. As discussed in the previous section, most of the foodstuff imported by Germany was not directly consumed by humans, but was used as provisions for the countries farm animals. According to Vincent, nine-tenths of the meat consumed in Germany came almost entirely from livestock that feed on foreign imported fodder. These farm animals also provided most of the country's dairy produce, which included milk, cheeses, and butter, of which the latter two were staple products in the German diet, and regarded with the utmost importance.48 Without access to quality fodder, farm animal's health began to suffer, and they subsequently produced less than adequate byproducts for human consumption. According to one report from the Centre for the Care of the Young, the results of cattle that ate less nutritious foods was milk that was 'considerably watered,' and lacked fats needed for youth during this important stage of development.49 This was therefore a classic example of an imbalance at one end of the food chain effecting the next link's livelihood and vitality. 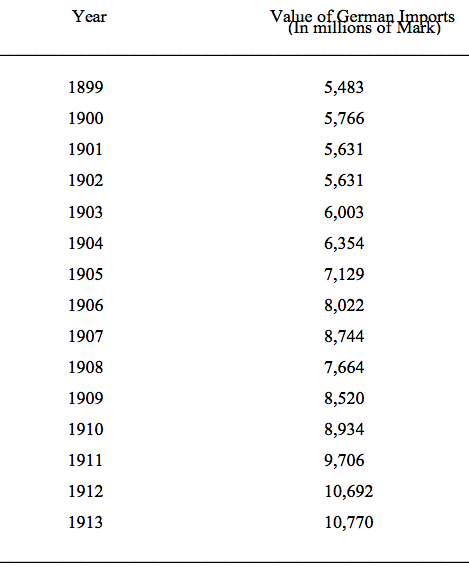 By 1917, and going into 1918, German livestock counts reached all time lows, and those that survived weighed significantly less than they would have if proper fodder supplies were available (see Graph 1.1 in Appendix). 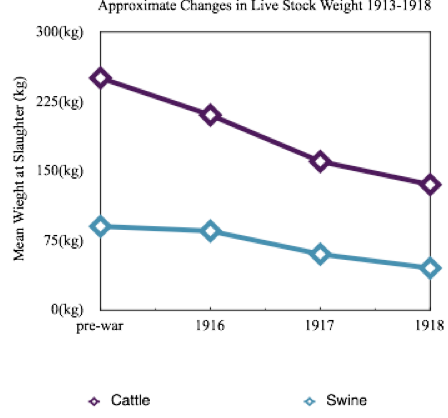 As the war dragged on into a third year, swine stocks fell by nearly seventy-seven percent of pre-war levels, and cattle to just thirty-two percent of peacetime inventory. What remained of these important sources of human nourishment were severely emaciated animals that often provided little or no meat for human consumption (see Graph 1.2 in Appendix).50 Without access to large quantities of foodstuff because of the blockade, German farmers were unable to provide adequate nourishment to their livestock, which left the population with foods that were neither filling, nor adequate to meet their nutritional needs. According to a report entitled Hunger, issued by The School Care Committee Section of the Berlin Teachers' Union, "The moral sense was in many cases deadened by the animal fight for existence. The feelings of physical pain, hunger and thirst, physical exhaustion and enervation, dominated nearly all sensations, and often influenced desire and action. "52 As food became more scarce, German civilians began acting out primal instincts to feed themselves, and in many cases this need dominated their entire lives. According to the same report, morals, cultural norms, and laws were often blatantly disregarded as millions sought to obtain what they and their families needed to survive. This often caused otherwise law abiding citizens to engage in illicit acts such as theft, cheating, or assaulting other citizens in their never ending quest to feed themselves (see figure 1.3 in Appendix). In the southern German city of Stuttgart alone, within a three month span in 1917, two hundred and seventy three children ranging between the ages of twelve and fourteen were arrested, and convicted of theft. In every one of these cases, the accused child was charged with attempting to steal food from farms.54 Like their fellow adults, children were acting out of a primal instinct to feed themselves in order to survive, regardless of whether this required action outside the legal limits set by the society. Dwindling food rations was not the only problem that the German army faced in 1917-1918. Clothing and other equipment also began to diminish in both quantity and quality during the last two years of the war. Whereas earlier in the war, the military was clothed adequately at the expense of the home front or other occupied territories, from 1917 onward, stocks of cotton, wool, and other fibers used to make uniforms and other equipment had been exhausted, and Germany was of course unable to replenish them because of the blockade. According to Bouton, the result of these shortages were that between 1917-1918, German soldiers were issued uniforms that was inadequate to keep there bodies warm, or protect them from the elements. Hundreds of thousands received boots without soles, no socks, jackets without buttons, and shirts made from donated women's undergarments, if they received any at all.57 While clothing may seem insignificant to the war effort, without proper uniforms and accompanying equipment, the soldiers ability to withstand the harsh realities of trench life decreased. Similarly, their morale could be severally compromised, thus jeopardizing the countries ability to continue the war into the future.